"Grilled salmon wrapped up in a small tortilla, topped with peach-mango salsa, shredded cabbage, avocado, and a special sauce." Combine mangoes, peaches, poblano peppers, red onion, juice of 1/2 a lime, and 1/2 the cilantro in a large bowl to make mango salsa. Cover with plastic wrap and refrigerate, at least 1 hour, preferably overnight. Mix sour cream, mayonnaise, ketchup, cayenne pepper, salt, and black pepper in a small bowl to make special sauce. Preheat oven to 350 degrees F (175 degrees C). Arrange tortillas on a baking sheet. Preheat a grill pan over medium-high heat; coat with cooking spray. Cook salmon until easily flaked with a fork, about 4 minutes per side. Transfer to a plate and flake into smaller pieces with a fork. Heat tortillas in the preheated oven until warmed through, about 5 minutes. 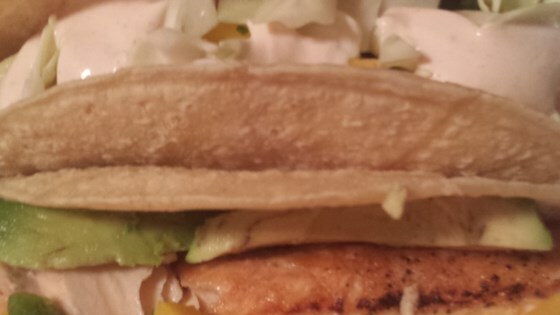 Divide salmon among tortillas. Top with mango salsa, special sauce, shredded cabbage, avocados, and remaining cilantro. Wrap up tacos and serve lime wedges alongside. Use flour tortillas instead of corn tortillas if preferred. Substitute nectarines for the peaches if desired. Substitute Anaheim peppers for the poblano peppers if desired. Very good and tasty. Didn't care too much for the special sauce so just used a little. Great pairing of the Salmon and Mango. Will make again.